The amusement is at all new heights this August as Working Mom Magazine’s “All About Kids” event ups the standards on shopping for the family with not just a great find-filled bazaar, but a unique, one-of-a-kind indoor carnival-themed shopping destination for both kids and parents to enjoy. 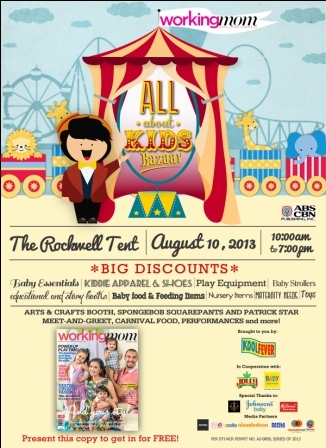 On August 10 at the Rockwell Tent, Working Mom will be putting together a day that’s filled with all sorts of dazzling sights—bringing more than just a shopping experience, but a fun bonding day for the whole family. What sets this bazaar apart from all the rest, however, is that there is so much for the kids to have fun with. Being a miniature carnival in itself, jugglers, magicians, and other performers will be around to give the little ones an experience worth remembering. Lulu Nails and Dry bar will be giving free Little Lulu manicures for the kids, and there will also be fun favorite carnival food stands that serve cotton candy, shaved ice and popcorn. Even cartoon favorites Spongebob Squarepants and Patrick Star will be around to join in on the festivities. The “All About Kids” bazaar is being brought to you by KOOLFEVER, in cooperation with Baby Company and Jolly Corn, and with the participation of Johnson & Johnson.